Interstate 264 in Virginia is an east-west freeway parallel to U.S. 58 between Chesapeake and Virginia Beach. The route serves commuter interests from Suffolk east into Portsmouth and Virginia Beach west into Norfolk. Additionally the original Virginia Beach-Norfolk Expressway portion of I-264 serves traffic bound for the Atlantic beaches. The tolled Downtown Tunnel carries Interstate 264 across the Elizabeth River Southern Branch between Downtown Portsmouth and Berkley in Norfolk. The Berkley Bridge, a double-leaf bascule bridge with a vertical navigational clearance of 50 feet,1 takes the route north from Washington Point to Downtown Norfolk over the Elizabeth River Eastern Branch. Further east, a lengthy collector distributor roadway system separates mainline traffic from ramps to U.S. 13 (Military Highway), Interstate 64 (Hampton Roads Beltway) and Newtown Road on the Virginia Beach and Norfolk city line. 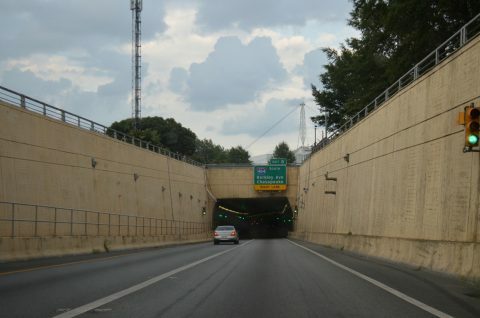 Entering the Downtown Tunnel along Interstate 264 eastbound. The eastbound tube starts at Court Street, while the westbound bore emerges a bit further east below Pavilion Drive. The eastbound tunnel passes directly below an outdoor amphitheater. Photo taken July 28, 2013. 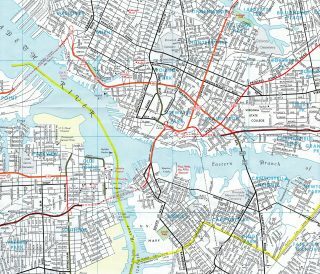 Originally planned as a route through Downtown Norfolk, most of the freeway was complete by 1972 with the exception of the Downtown Tunnel and Berkley Bridge. The Elizabeth River crossings between the cities of Norfolk and Portsmouth opened in 1952 with two lanes through the tunnel and four lanes on an undivided bridge. Federal Interstate funding, covering 90% of the costs, was approved to upgrade the 2.2-mile bridge and tunnel complex in 1978. I-264 as it appeared on the 1971 Virginia Official Highway Map. 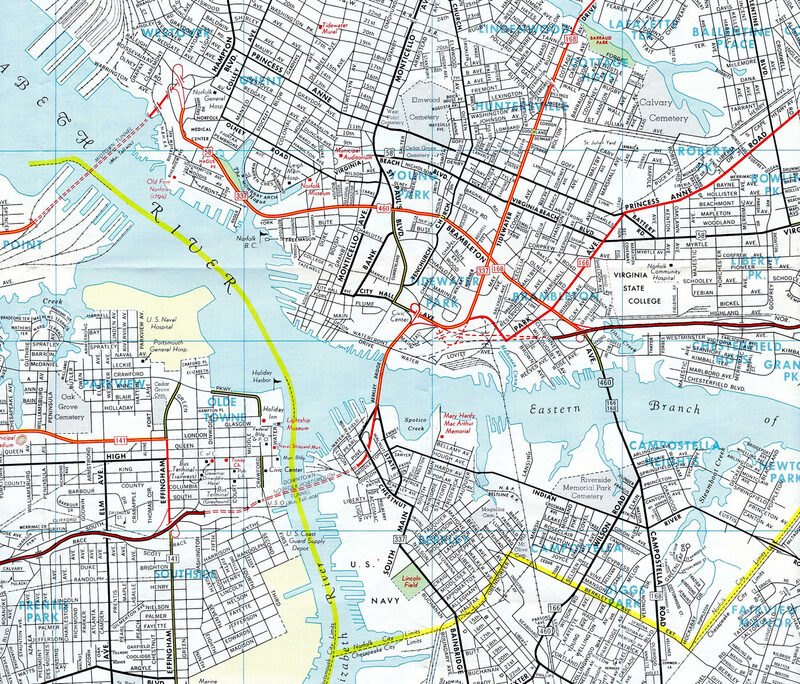 This 1972 General Drafting Map of Norfolk shows the surface route connections between the Berkley Bridge and Interstate 264 leading east from Brambleton Avenue. Interstate 264 widens to form the couplet of 21st and 22nd Streets east of Birdneck Road. An end advisory sign was installed at the roadway split in 2002. It was replaced in 2015 with larger white on green signs. Photo taken by Jonathan Lebowitz (08/02). Speed limits decrease to 35 miles per hour as Interstate 264 (Virginia Beach-Norfolk Expressway) transitions to 21st Street east. Photo taken by Jonathan Lebowitz (08/02). An end shield for Interstate 264 precedes the traffic light with Parks Avenue. 21st Street east extends 0.6 miles to Atlantic Avenue just off the beach. Photo taken by Jonathan Lebowitz (08/02). A companion end shield for I-264 stands along the right side of the freeway conclusion at Parks Avenue. Photo taken by Adam Froehlig (02/23/03). Atlantic Avenue north at 22nd Street west. 22nd Street transitions into Interstate 264 in six blocks. Photo taken 03/01. A state-named shield was included in the internally lit street sign for 22nd Street west above Atlantic Avenue north. This sign was replaced by 2014. Photo taken 03/01. 22nd Street west upgrades to Interstate 264 immediately after the signalized intersection with Parks Avenue. The concrete surface pictured here was paved over with asphalt after 2011. Photo taken 03/01. Interstate 264 leads southwest from the full cloverleaf interchange (Exit 2) with Greenwood Drive another 1.5 miles to end at a three-wye interchange with I-64 outer and I-664 north. Photo taken 01/01. Advance signage posted for the I-264 westbound transition onto I-664 north. Interstate 664 north meets U.S. 13-58-460 just to the west at Bowers Hill. Photo taken 01/01. A left exit shuttles motorists onto Interstate 64 outer leading southeast back toward Chesapeake as the I-264 mainline defaults onto I-664 north through Suffolk. Photo taken 01/01. An end sign for I-264 west stands along the transition to Interstate 664 north. A similar assembly appears along the ramp to I-64 outer. Photo taken 12/27/00. Interstate 664 (Hampton Roads Beltway) south advances east with three overall lanes from Exit 14 (Military Highway) to the split for Interstate 264 east and Interstate 64 outer. Photo taken 07/28/13. Interstate 264 runs northeasterly from the ending I-664 to Portsmouth and the tolled Downtown Tunnel toward Norfolk. I-64 extends the Hampton Roads Beltway southeast to Yadkin and Chesapeake, where it meets I-464 north and VA 168 south. Photo taken 07/28/13. Interstate 64 inner curves northward leading to the joint termini with Interstates 264 west and 664 south. Photo taken by Tony Payne (04/00). Exit 299A departs from the ending I-64 inner for Portsmouth as the Hampton Roads Beltway turns west along side I-664 north to Bowers Hill and the junction with U.S. 13-58-460. Photo taken 03/01. 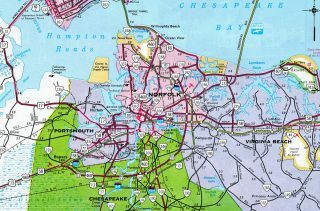 Hampton Roads Area Interstates and Freeways, Roads to the Future web site (Scott Kozel). “Tolls on Two Tunnels to End.” Richmond Times-Dispatch, July 29, 1986. “AFTER DELAYS, TUNNEL TO OPEN IN PORTSMOUTH.” Richmond Times-Dispatch, March 4, 1987. “DOWNTOWN TUNNEL OFFICIALLY REOPENED AFTER RENOVATION.” Richmond Times-Dispatch, December 21, 1988. “NEW WATERSIDE RAMP TO I-264 TO OPEN.” Virginian-Pilot, The (Norfolk, VA), April 7, 1990. “2ND BERKLEY BRIDGE WILL OPEN THIS MORNING.” Virginian-Pilot, The (Norfolk, VA), May 24, 1990. “TWICE AS NICE: AT LONG LAST, IT’S BERKLEY ‘BRIDGES,’ PLURAL.” Virginian-Pilot, The (Norfolk, VA), June 26, 1991. “Tolls now in effect at Downtown, Midtown Tunnels.” WTKR, January 31, 2014. “New toll rates in effect at Downtown, Midtown tunnels.” 13NewsNow, January 1, 2015. “EXPRESSWAY RENAMED< BIG IMPROVEMENT< FINAL APPROVAL HAS BEEN GRANTED TO CHANGE ROUTE 44 TO I-264.” Virginian-Pilot, The (Norfolk, VA), February 6, 1999. “NEXT WEEK: HOV ACCESS TO EXPAND, ROUTE 44 TO BECOME INTERSTATE 264.” Virginian-Pilot, The (Norfolk, VA), April 29, 1999. Page updated January 4, 2016.